Col 3:1-3 – If ye then be risen with Christ, seek those things which are above, where Christ sitteth on the right hand of God. Set your affection on things above, not on things on the earth. For ye are dead, and your life is hid with Christ in God. Eagle vision is unique among God’s creatures. 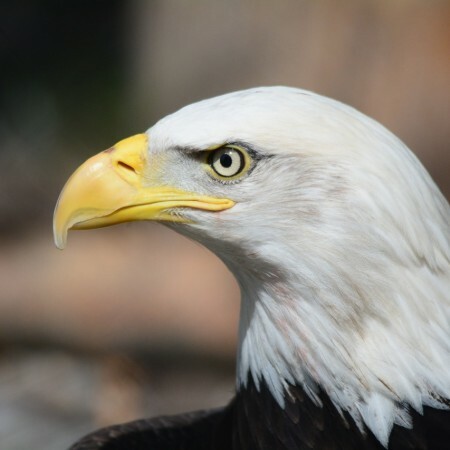 Eagles and other birds of prey have a very keen sense of vision that is well beyond humans. They have a fourth color receptor that extends their vision range into the ultraviolet. They have much higher density of receptors than humans. They have very good binocular vision to judge depth. They are very well suited by their creator to hunt because of this very advanced vision. When we take on Christ’s righteousness we acquire a new form of advanced vision. We get that quick-sighted eye like Leighton describes, whereby we can see through the sky and stars to a heaven which is not seen. More often than once, I have looked out at a night sky toward the North Star and thought of God’s abode being somewhere beyond that. A Christian should be like the eagle that flies high above the fray and trouble of this world and sees ahead toward heaven. Our vision, like an eagle, always needs to be on things above. It needs to be keen, like an eagle, to discern right and wrong. The eagle’s affection is always on the lookout for his prey. Our affections should always be on the lookout for the things of God and heaven. We are to be dead to this world and alive to the things of God. Keep your eye on the prey of heaven and don’t lose sight of the prize. This post has been seen 1425 times.